First and foremost, this is my very first experience with Code Signing. I bought Standard Code Signing from Certum for 3 years. I intend to publish applications in Czech republic mostly. But to the point, on Windows 10, when I download the signed executable, I get bumped by Smart-Screen filter which blocks the application. I don't know what to think. I used SHA256 and a time stamp. I signed it on Windows 8.1 fully updated. SignTool sign /fd SHA256 /a /tr http://time.certum.pl "Barvy.exe"
Applications that are signed with a standard code signing certificates need to have a positive reputation in order to pass the Smart Screen filter. Microsoft establishes the reputation of an executable based upon the number of installations world wide of the same application. Since you haven't published your application as yet (and therefore the reputation hasn't been established as yet), the Smart Screen will continue to flag the application. Programs signed by an EV code signing certificate can immediately establish reputation with SmartScreen reputation services even if no prior reputation exists for that file or publisher. 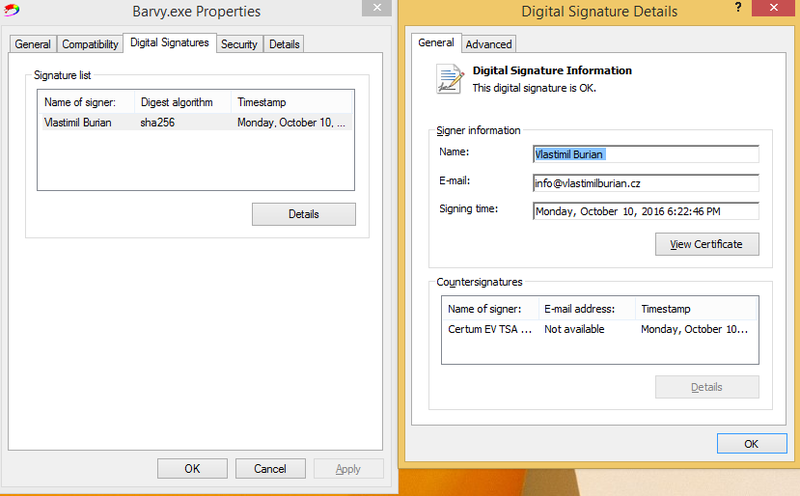 You can find further details at Microsoft SmartScreen & Extended Validation (EV) Code Signing Certificates blogpost. If you have a standard code signing certificate, some time will be needed for your application to build trust. Microsoft affirms that an Extended Validation (EV) Code Signing Certificate allows to skip this period of trust building. According to Microsoft, extended validation certificates allow the developer to immediately establish reputation with SmartScreen. Otherwise, for some time, until your application builds trust, the users will see a warning like "Windows Defender Smartscreen prevented an unrecognized app from starting. Running this app might put your PC at risk. ", with the two buttons: "Run anyway" and "Don't run". Another Microsoft resource states the following (quote): "Although not required, programs signed by an EV code signing certificate can immediately establish reputation with SmartScreen reputation services even if no prior reputation exists for that file or publisher. EV code signing certificates also have a unique identifier which makes it easier to maintain reputation across certificate renewals." Not the answer you're looking for? Browse other questions tagged code-signing internet-explorer microsoft-edge or ask your own question. Is a self signed certificate sufficient to prove the integrity of my executable? Why does the tool 'codesign' in OS X 10.11 (El Capitan) report every Python process as “code object is not signed at all”?